The International Labour Organisation’s chief, Guy Ryder has urged governments and social partners to work together to build a world of work that leaves no one behind. Rome: “The future of work must be inspired by considerations of humanity, of social justice and peace. If it is not, we are going to a dark place, we are going to a dangerous place,” said the head of the leading world body specialised on labour issues. 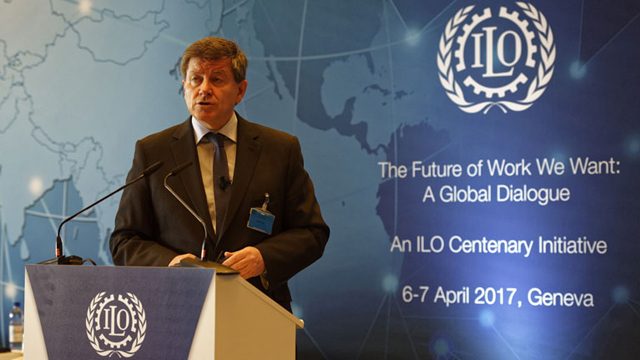 With a forceful call to make social dialogue between governments and the social partners a key instrument for building a world of work that leaves no one behind, Guy Ryder, director general of the International Labour Organisation (ILO) summed up a landmark event on the future of work. The event, which took place at ILO’s headquarters in Geneva, brought together leading economists, academics and representatives of governments and the social partners (employers’ and workers’ organisations) to discuss the profound changes sweeping the world of work. “The future of work must be inspired by considerations of humanity, of social justice and peace. If it is not, we are going to a dark place, we are going to a dangerous place,” said ILO chief, Ryder. More than 700 participants attended the event in Geneva with several hundreds joining and participating via the Internet and social media. The Geneva meeting also featured a special session on how to shape the future of work for youth, with a particular focus on the transition from school to work, the organisation of the world of work and its regulation. He reminded those present that the future of work was a global issue that merited a global response, but also one that requires “taking into consideration the diverse circumstances of our 187 member states” and the importance of sharing experiences among them. The head of the ILO emphasised the need to promote innovation and development, at the same time as maintaining the organisation’s social objectives. The global dialogue was part of a broader ILO programme ‘The Future of Work Centenary Initiative‘ which aims to investigate the future of work and better understand the drivers of unprecedented change, including technological innovation, the organisation of work and production, globalisation, climate change, migration and demography, among others. The initiative is seeking to broadly canvas the views of key actors in the world of work on all of these issues, says the ILO. More than 167 countries have taken part in the initiative so far, with 107 of them participating in national and regional dialogues that have been or are being held all around the world. Their conclusions will help inform a High Level Global Commission on the Future of Work, to be established by the ILO later this year. The report of the commission will feed into discussions on a Centenary Declaration at the 2019 International Labour Conference. Around the world, profound changes in the nature of work are underway, the ILO said, adding that the on-going transformations in the world of labour are disrupting the connection between work, personal development and community participation. The future of work gains special relevance now that it is estimated that over 600 million new jobs need to be created by 2030, just to keep pace with the growth of the global working-age population. That’s around 40 million per year. Meantime, there is a pressing need to improve conditions for the some 780 million women and men who are working but not earning enough to lift themselves and their families out of just $2 a day poverty. What are the new forms of the employment relationship and whether and to what extent that relationship will continue to be the locus for many of the protections now afforded to workers? And: what initiatives to revitalise existing norms and institutions and/or create new forms of regulation that may help to meet present and future governance challenges? How will societies manage these changes? Will they bring together or pull apart developed, emerging and developed economies? Where will the jobs of tomorrow come from and what will they look like? What are the challenges and opportunities young people are facing as they make the transition into the world of work? What do they see as the path forward to achieve sustainable inclusive growth for future generations? Around the world, in economies at all stages of development, profound changes in the nature of work are underway, the UN specialised body explained, adding that numerous and diverse drivers account for these: demographic shifts, climate change, technological innovation, shifting contours of poverty and prosperity, growing inequality, economic stagnation and the changing character of production and employment. “We are facing the twin challenge of repairing the damage caused by the global economic and social crisis and creating quality jobs for the tens of millions of new labour market entrants every year,” said Guy Ryder ahead of the meeting. According to the ILO chief, persistent high levels of vulnerable forms of employment combined with a clear lack of progress in job quality – even in countries where aggregate figures are improving – are “alarming”. In fact, the ILO’s World Employment and Social Outlook – Trends 2017 shows that vulnerable forms of employment – i.e. contributing family workers and own account workers – are expected to stay above 42% of total employment, accounting for 1.4 billion people worldwide in 2017. Almost one in two workers in emerging countries are in vulnerable forms of employment, rising to more than four in five workers in developing countries, said Steven Tobin, ILO senior economist and lead author of the report. Meanwhile, the global unemployment rate is expected to rise modestly from 5.7 to 5.8% in 2017 representing an increase of 3.4 million in the number of jobless people, a new ILO report shows.